Get to the poolside in style with women’s swimwear and cover ups on sale at Neiman Marcus. We offer a fine selection of styles in trending silhouettes at amazing rates. Our swimwear sale features an extensive variety of one-piece and two-piece swimsuits in bright colors and versatile designs. We carry cover up dresses, caftans, and tunics in relaxed fits. Our cover ups on sale bear a sophisticated touch that will make heads turn while you’re soaking up the sun. Neiman Marcus’ swimwear on sale is suitable for all body shapes. Make the most of our sale and choose the swimsuits that catch your eye. Meticulously crafted, the collection features some of the best designer names. Now get them all at amazing price points. Shop Neiman Marcus for fashionable swimsuits and cover ups on sale. Letarte "Essentials" one-piece swimsuit. 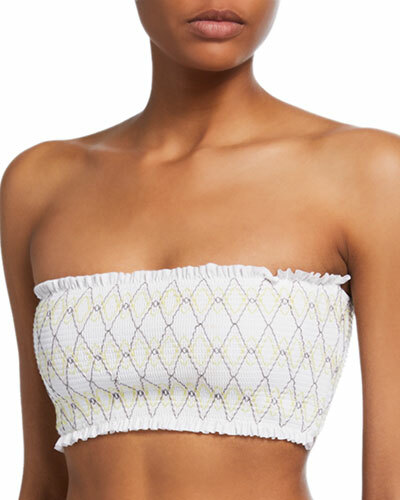 Twisted bandeau neckline. Removable halter shoulder straps. Ruched detailing throughout bodice. Classic silhouette. Full seat coverage. Letarte "Essentials" one-piece swimsuit. Twisted bandeau neckline. Removable halter shoulder straps. Ruched detailing throughout bodice. Classic silhouette. Full seat coverage. Polyester/Lycra® spandex. Imported. Model's measurements: Height 5'11"/180cm, bust 32"/81cm, waist 25"/64cm, hips 36"/91cm, dress size US 2/4. Mara Hoffman "Isolde" one-piece bathing suit in brushstroke colorblock striped microfiber. Wrap front with adjustable ties. Adjustable spaghetti straps. Moderate seat coverage. Cutout midriff. Recycled polyester/spandex. Made in USA of Italian materials. Model's measurements: Height 5'9"/175cm, bust 31"/79cm, waist 23"/58cm, hips 34"/86cm, dress size US 0/2.